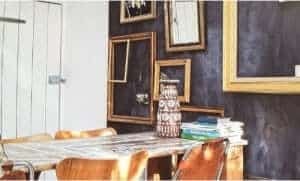 DIY ChalkBoard Paint – As seen in cute coffee shops and fun DIY projects, DIY ChalkBoard Paint has grown in popularity to create a rustic and creative vibe to any project, place, and items for décor. Once originated in the classroom, the chalkboard surface now gives a shabby chic effect to any room. The best part is that it can be used with many themes for many purposes to create an artistic environment for anyone willing to pick up a piece of chalk. Not to mention, it’s something that can keep your children entertained for hours on end. As a delight as it is to see and use, the paint when bought over the counter can range a little higher in price tag with a quart going for as much as $25-$30. Lucky for us, we can save some money and even open up the color choices by simply making it on our own with an easy-to-do DIY tutorial. In our sample, we have created our own smaller version of the photo above by applying the paint to the backing of an old picture frame. 1. Use the newspaper to cover your mixing area. 3. Pour the desired amount of paint and grout into the mixing bucket. 4. 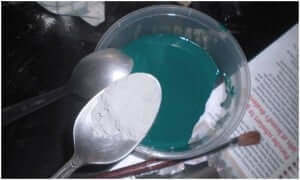 Use the stick or old spoon (a plastic spoon can be used as well) to mix the paint well until it is completely blended. Once this is done, your paint is ready to use! 5. 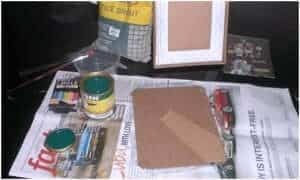 Use the paint brush or roller to apply the paint mixture to the surface. 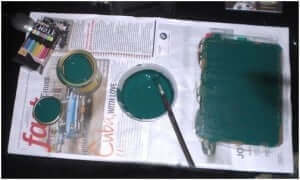 Cover the entire surface with 1-2 coats of paint. Then allow it to completely dry. 6. Once it’s dry, run your fingers on the surface and feel how smooth it is. Depending on the type of grout used some can feel grainier than others. If you feel there is too much grain to the surface, simply use the sand paper and gently rub the surface until smooth. 7. Once smooth, your chalkboard is ready to be drawn on. Take any piece of chalk and let your creative juices flow! 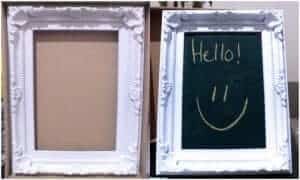 This is a fun way to repurpose old picture frames if you have any lying around the house. We used this board to write daily quotes, make to-do lists, and write short simple messages or reminders. Jars – label contents such as sugar, coffee, spices, and more. Other Walls- create an accent wall and apply chalk typography or hang picture frames. Tip: If you’re painting on a door or wall, apply a primer if the surface is glossy.